In 1972, he served as Aide de Camp to Governor-General Sir Paul Hasluck. He returned to regimental life as second in command of a Company, rising to Adjutant then Company Commander in the Army’s 5th Battalion Royal Australian Regiment (5 RAR), then 5/7 RAR in Holsworthy, Sydney. Subsequent appointments included a period as a tactics instructor at the Army’s Infantry Centre in Singleton, New South Wales; a year’s study at the United States Marine Corps Staff College in Quantico, USA; extended periods of duty in the United Kingdom and India; and command of 1 RAR. He was appointed a Member in the Military Division of the Order of Australia (AM) for his service in command in 1983-84. Promoted to Lieutenant General, he was appointed Chief of Army in 2000. After further promotion to General, he served as Chief of the Defence Force from 2002-2005. He retired from the Australian Defence Force in 2005. Subsequently, he accepted positions on several boards, including QANTAS, Cardno and the Australian Rugby Union. He was appointed by the Queensland Government to lead the taskforce rebuilding communities in the Innisfail region following the devastation caused by Cyclone Larry in 2006. 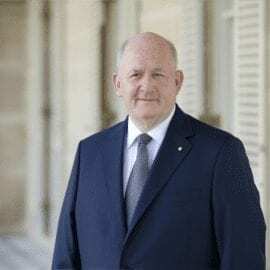 From 2007 to 2012, he chaired the Council of the Australian War Memorial, and served as Chancellor of the Australian Catholic University from 2010 until early 2014. Professor Barry Golding and Professor John Macdonald. Both Barry and John have made significant contributions to the Men’s Shed movement and to the development of AMSA and to both we owe a great deal. Our Patrons continuing responsibility will be to support AMSA and our members within their specific areas of expertise and make representation on our behalf. I am sure all the members graciously welcome our Patrons and join in my sentiment and pride in stating that these three fine men who have given so much to Men’s Sheds and men in saying “we are proud to be able to call them our mates”. Barry is a man who needs no introduction to those involved with Men’s Sheds. Without doubt, Barry is the most respected academic researcher who has dedicated so much to the Men’s Shed movement and is renown internationally amongst ‘shedders’. Professor Golding, an experienced researcher in Adult, Vocational and Community Education, is author of the NCVER publication ‘Men’s Sheds in Australia: Learning through community contexts’ which has been undeniably one of the most valuable tools and most common references for those initiating a Men’s Shed project. Barry has also presented comprehensive papers and speeches at all three National Men’s Shed Conferences and is a strong advocate of AMSA. Professor John Macdonald, founding Chair in Primary Health Care University of Western Sydney, Director Men’s Health Information and Resources Centre (MHIRC), President of the Australasian Men’s Health Forum, National Men’s Health Ambassador. John is acknowledged as the most respected authority on Men’s Health with strong beliefs in the capabilities of Men’s Sheds contributing to making a difference to the well-being of men. An advocate of the Social Determinants of Health, John is also the Chair of the Mt Druitt Shed project that delivers services primarily for Aboriginal and Torres Strait Islander men. Professor Macdonald has been of great support to AMSA and our members by being a strong advocate of Men’s Sheds both domestically and internationally. ‘The Men’s Shed movement is a new and dynamic way to engage with older men and is already having success in improving health and wellbeing. There is also a great deal of promise for how this movement can improve men’s mental health outcomes. As well as the health outcomes, there are many reasons to consider why the Men’s Shed movement is important on social and community levels’.